1 A None No Power Seat 1 A has extra legroom due to the location of the bulkhead. The tray table is in the armrest, making the armrest immovable and slightly reducing seat width. There is no floor storage during takeoff and landing. The close proximity of the galley may be bothersome. 1 C None No Power Seat 1 C has extra legroom due to the location of the bulkhead. The tray table is in the armrest, making the armrest immovable and slightly reducing seat width. There is no floor storage during takeoff and landing. The close proximity of the galley may be bothersome. 11 A None No Power Seat 11 A has extra legroom due to the exit row but limited recline. There is no floor storage during takeoff and landing. 11 B None No Power Seat 11 B has extra legroom due to the exit row but limited recline. There is no floor storage during takeoff and landing. 11 C None No Power Seat 11 C has extra legroom due to the exit row but limited recline. There is no floor storage during takeoff and landing. 11 D None No Power Seat 11 D has extra legroom due to the exit row but limited recline. There is no floor storage during takeoff and landing. 11 E None No Power Seat 11 E has extra legroom due to the exit row but limited recline. There is no floor storage during takeoff and landing. 11 F None No Power Seat 11 F has extra legroom due to the exit row but limited recline. There is no floor storage during takeoff and landing. 12 A None No Power Seat 12 A has extra legroom due to the emergency exit row. However, there are no window-side armrests, which can be uncomfortable. There is no floor storage during takeoff and landing. 12 B None No Power Seat 12 B has extra legroom due to the emergency exit row. There is no floor storage during takeoff and landing. 12 C None No Power Seat 12 C has extra legroom due to the emergency exit row. There is no floor storage during takeoff and landing. 12 D None No Power Seat 12 D has extra legroom due to the emergency exit row. There is no floor storage during takeoff and landing. 12 E None No Power Seat 12 E has extra legroom due to the emergency exit row. There is no floor storage during takeoff and landing. 12 F None No Power Seat 12 F has extra legroom due to the emergency exit row. However, there are no window-side armrests, which can be uncomfortable. There is no floor storage during takeoff and landing. 2 D None No Power Seat 2 D has extra legroom due to the location of the bulkhead. The tray table is in the armrest, making the armrest immovable and slightly reducing seat width. There is no floor storage during takeoff and landing. The close proximity of the galley may be bothersome. 2 F None No Power Seat 2 F has extra legroom due to the location of the bulkhead. The tray table is in the armrest, making the armrest immovable and slightly reducing seat width. There is no floor storage during takeoff and landing. The close proximity of the galley may be bothersome. 28 A None No Power Seat 28 A is in the last row of the aircraft and has limited recline. The proximity of the lavatories may be bothersome. 28 B None No Power Seat 28 B is in the last row of the aircraft and has limited recline. The proximity of the lavatories may be bothersome. 28 C None No Power Seat 28 C is in the last row of the aircraft and has limited recline. The proximity of the lavatories may be bothersome. 28 D None No Power Seat 28 D is in the last row of the aircraft and has limited recline. The proximity of the lavatories may be bothersome. 28 E None No Power Seat 28 E is in the last row of the aircraft and has limited recline. The proximity of the lavatories may be bothersome. 28 F None No Power Seat 28 F is in the last row of the aircraft and has limited recline. The proximity of the lavatories may be bothersome. After the video safety instructions, the panoramic camera shows images on overhead screens from outside the aircraft during takeoff and landing, on the Airbus A320 aircraft operating in Europe. The A320-200 is used on short-haul domestic and European routes from Helsinki. This aircraft is equipped with all Economy Class seats. Depending on demand, these seats can be converted to Business Class by reserving the middle seat for exta space. Good leg space, for an exit row not as much as i expected, but still much better than other rows! I had an A320 with more rows on both sides (28 rows). I sat on 27D and there was more or less no leg space. I am a tall man. It was a pain from Munich to Helsinki. 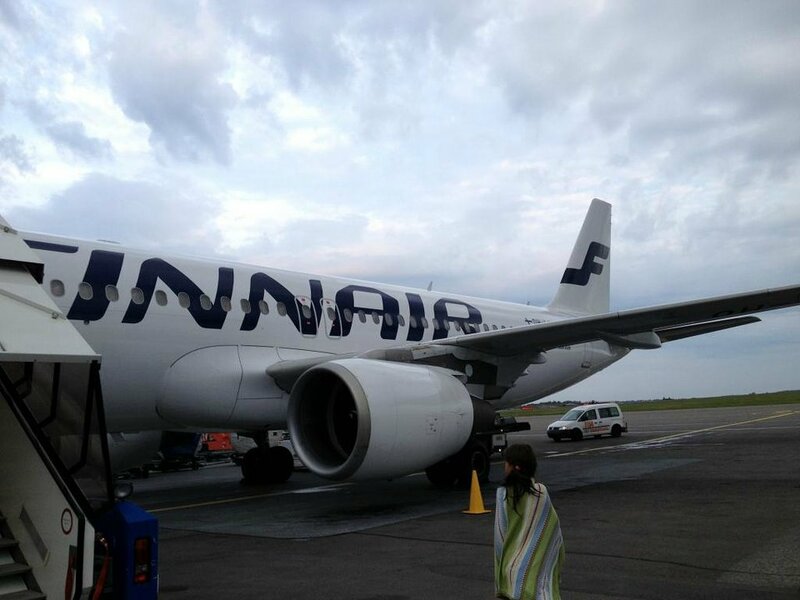 Finnair flies 1 versions of Airbus A320.